Six Flags Fiesta Texas is unveiling the ninth and most exciting coaster in the park’s 23-year history – BATMANTM: The Ride, available to guests on May 23, kicking off the park’s anticipated daily summer season. After being lifted straight up a 120-foot hill, this 4D Wing Coaster challenges riders to “face their fears” as they flip head-over-heels from four to eight times along the weightless, tumbling journey. Along the way on this 4th dimension free-fly coaster, thrill seekers experience exhilarating coaster hills and unexpected drops along with an interactive ride experience, making it a different sensation each time guests ride. BATMANTM: The Ride allows adrenaline seekers to soar outside the confines of the track and fly like Batman. “We are thrilled to deliver a ride experience not to be found anywhere else on earth. Not only does BATMANTM: The Ride utilize the latest innovative technology, it is highly interactive and will deliver something new for every rider. It’s a great complement to our existing ride offerings and should be quite a hit with thrill seekers and season passholders alike. The ultra-smooth, unanticipated tumbling will add a new element as riders travel along the dipping and swirling track,” said park president Neal Thurman. 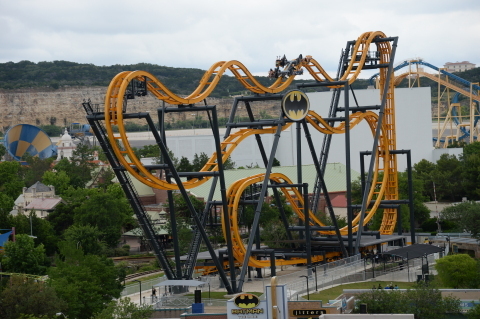 BATMANTM: The Ride features a massive, imposing, floating and twisting track frame, in which ride vehicles begin their journey by traveling up a 120-foot elevator-type lift before being released for their highly unusual sensory journey-including two beyond-vertical free falls, in addition to four to eight head-over-heels flips. Not only is BATMANTM: The Ride the most exciting thrill ride in Six Flags Fiesta Texas history, it is currently not available anywhere else on the planet. This attraction, based on the popular DC Comics Super Hero, will offer a total immersion into the Batman storyline with numerous special effects including the world-famous Batmobile and Bat-Signal. Experience the thrills of Six Flags Fiesta Texas all year with a 2015 Season Pass. Purchase a Season Pass four pack today and receive one free Fiesta Texas Season Parking Pass. A Season Pass offers unlimited visits to both the theme park and White Water Bay Water Park and comes with in-park savings on food, games and souvenirs, free tickets for friends and access to exclusive events. Purchase your 2015 Season Pass online now at sixflags.com. Six Flags Entertainment Corporation is the world’s largest regional theme park company with $1.2 billion in revenue and 18 parks across the United States, Mexico and Canada. For 54 years, Six Flags has entertained millions of families with world-class coasters, themed rides, thrilling water parks and unique attractions including up-close animal encounters, Fright Fest(R) and Holiday in the Park(R). For more information, visit www.sixflags.com. BATMAN and all related characters and elements are trademarks of and (c) DC Comics.